New Taipei City will be launched at the end combined with special garbage bags shopping bags shopping bags dual function , first pilot will be fully associated welfare centers , 15 liter , priced $ 6. Supermarkets, convenience stores shopping bags special bags can also be used as rubbish ! New Taipei City Government and the whole joint welfare centers, creating the country's first launch combine shopping bags and garbage bags dedicated dual-function 15 -liter bags , retail price of 6 yuan ( by New Taipei garbage removal treatment rate 0.4 per liter dollars ) , will be officially the fastest at the end of the road. Trans Union tailored for the new Taipei City Government and the current special garbage bags with the color pink shopping bags, coming in the whole Union , New Taipei City 109 outlets , in addition you can buy now sold in red, blue shopping bag , but also You can also buy special bags can also be used as garbage bags , home can be a special garbage bags, wallets both environmental and cost savings . It is understood that the new Taipei City Government is also actively negotiate with Carrefour , Carrefour PR Ho Mo true that is still under evaluation , this phase has not joined. New Taipei City Government will work with supermarkets, super business in cooperation , primarily in major retailers' monthly number of shopping bags sold quite amazing . According to the Family Mart revealed that year by the four convenience stores nationwide sold the number of shopping bags break 10 million , Carrefour hypermarket industry in Taiwan 69 stores a month's amount of plastic shopping bags printed about 500,000 , a was conservatively estimated that at least 6,000,000 . As for the first precedent of cooperation with the new government wide joint North , they sold the number of shopping bags is far ahead supermarkets, convenience stores and hypermarkets , its new Taipei shopping bags sold about a month's 350,000 , Taipei more than 490,000 . 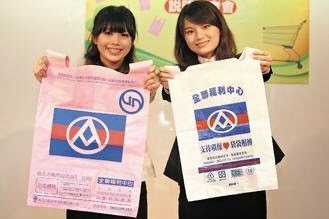 New Taipei City Environmental Protection Bureau Liu and then pointed out that the dual function of shopping bags is to use the store originally trafficked shopping bags of 15 liters of white material and style, color changed to pink , plus special garbage bags Xinbei security labels than the current special garbage bags better carry heavy loads. And Trans Union welfare centers belong to the supermarket industry's Matsusei said that if the supporting measures to do good, this policy allows the addition of a shopping bag use, very environmentally friendly , happy to see. Wellcome Supermarket in yet received any textual requirements, does not express any view, but Wellcome Supermarket stressed that if the policy set to implement , they must endeavor to cooperate and strengthen advocacy.